In Florida to help family with moving, we had one day available on our own to head off to Disney World. We stayed on property at the Pop Century Resort (see my article about it here). It was our first experience staying at a value resort at Disney World. We enjoyed our two nights there. Knowing from earlier winter visits that it can get cold (for us southerners) even in Florida, we planned ahead. A storm had passed through central Florida the day before, leaving our day calm and sunny. 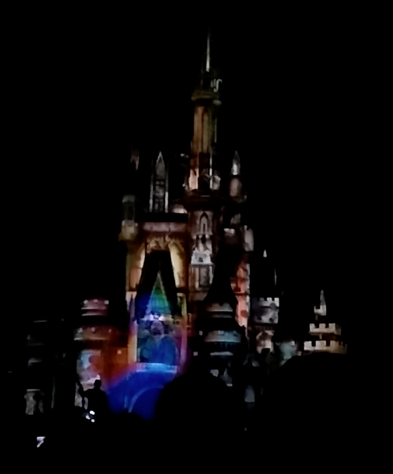 But even then, for this Wednesday, January 13, 2016, the temperature at Disney World reached a high 61°F, dropping into the 50s for that evening's electric parade and fireworks show. Yet we had an absolutely wonderful time. On our last cool weather visit to Disney World we were not quite as prepared as we would have liked...many around us were not prepared at all and paid the comfort price. So, for this visit to the parks, we were determined to plan even better. The only thing additional we needed was another light warm layer that fit easily in our light weight backpacks. As a result we fully enjoyed our day in the parks. We discovered that mid-week in January is an amazing time to visit Disney World if you like to avoid big crowds and long lines. Even waking up at a reasonable time, having a relaxing breakfast, and getting to the Epcot bus stop at our resort 15 minutes before its scheduled departure, we were still 15 minutes early. There was no line (there was a line for the Magic Kingdom bus, but everyone got on the first bus). Arriving at Epcot a half hour before it opened, we were at the very front of the line. By the time Epcot opened, there was a decent crowd behind us, but we ended up being the very first people into Spaceship Earth that day. At the end of the ride we had no-line access to the games and activities in that facility. What a great start to our day! We love Epcot and, for me especially, The Seas is a favorite. I didn't dive on this visit but we did enjoy watching the staff divers introducing new creatures into their new comfortable home. When you come here, don't miss seeing Turtle Talk with Crush. We never tire of his performance. Living with the Land is another favorite for us. I enjoy working a large vegetable garden at our home, and love seeing the work that is done here, especially the hydroponic gardens. On our way to The Land I was trying to use the My Disney Experience mobile app to schedule FastPass reservations. But for some reason, with our special media passes, I was having trouble getting it to work. Outside of The Land we ran into a very helpful cast member, Wyndy, who is from Texas (and, spelling aside, has a great name for Disney World). I thought she said she is from Friendship Texas, but I see that is a ghost town. I know Disney is magical, but we were nowhere near the Haunted Mansion, so I'm sure I heard the wrong town name. Anyway, Wyndy is an expert with the app and in a very short time my FastPass access was activated and I was scheduling my reservations. Thank you Wyndy. My wife wanted to find a pair of Crocs. The first two places we stopped to look were out of her size. At the third shop her persistence paid off. Throughout the rest of the day she commented on the wonderful walking comfort she enjoyed from her Crocs with Mouse Ears ventilation holes. We decided to have lunch in France, taking the Friendship Boat to Morocco (next to France). Nice. Then we strolled the short walk to Germany to take the return boat only to find that it was not running that day. This is a minor inconvenience that can come of small-crowd days, but almost everything else in the parks was still open. So instead we walked around that half of the Epcot World Showcase and dropped in on the exhibits and presentations at a few of the countries, seeing some we'd not seeing before (the standing 360 degree video at China is pretty amazing). Early afternoon we left Epcot to take the monorail to the Magic Kingdom. I miss the days when one could ride the front car and look out the 180 degree glass. We made it as far as the main transportation center. The monorail stage going to the Magic Kingdom was closed for "automation testing" that day. So we took a ferry to the Magic Kingdom. It had a large line but everyone fit. At the hotel and throughout our visit to the parks we enjoyed the new MagicBands that DisneyWorld now provides. A Mouse Ears wrist bracelet with RFID, an even higher level of convenience was provided to gain access to the park, to rides, to pay for anything (applied to our account). On our WDW visits we are continually amazed at the creative thoughtfulness that goes into every detail of the parks. Using the My Disney Experience mobile app on my phone, I was able to schedule three FastPass rides. Thinking (accurately as it turned out) that the lines would be longer at Magic Kingdom, I used our three FastPasses for that park. With the small crowds and a little magical luck, we were able to schedule FastPass entrance to the three main rides we were interested in and, even better, to schedule them in a logical path. On our last visit we ended up crisscrossing the park for our FastPass reservations, so going from one to the next in a shortest distance path was welcome to our older tireder feet. Some rides like Space Mountain had long lines later in the day, but for everything we experienced, it was essentially walk right on (especially since we used our FastPasses for the more popular attractions). After using a FastPass you're allowed to find a kiosk to schedule another (only the original three can be scheduled for a given day from the mobile app). I tried that, but the rides of interest by that time were already booked, and I wasn't disappointed. All of this allowed us to have a leisurely happy day at the two parks we visited. Not long before it was time for the Main Street Electrical Parade, we found our way to main street and scored a prime curb-side spot at a lamp post. There we could each relax by leaning on the post perpendicular to each other while enjoying fudge from the shop behind us with our waterproof backpacks to sit on. During the incredible, ever enjoyable Main Street Electrical Parade, we had as much fun watching the reactions of the children who sat with their families on either side of us as we did watching the parade. After the parade we walked with the crowd along Main Street toward the castle in preparation for the Celebrate the Magic on Main Street show that projects onto Cinderella's Castle and the fireworks show to follow. Incredibly, we were able to find a place at the best spot for the shows, with space all around us, no tall people in front of us, having a perfect view of the castle and positioned just right for Tinkerbell's grand spotlighted flight (invisible zipline) from the top of the castle all the way across to a platform off Main Street. It amazes me that the castle can be so clearly and magically transformed into different castles and Disney scenes. After the grand fireworks show that follows the castle show, we stuck around to let the crowds thin since, staying at a resort on property, we were allowed to stay later. We were too tired to walk back to the rides to do any more, so we sat at outdoor tables sipping hot chocolate, wishing the indoor restaurant next to us was still open. That is when the cold became too much even for the extra preparations we made. Calling it a night, we walked behind the big crowds leaving the park, finding our way to the bus that would return to our resort. Unlike our last visit, it was not raining and we did not have a long wait. Disney is also magical at moving large crowds in and out quickly. We were the very last to make it onto our bus, so we had to stand, but at least we were at the front, so not squished in with a crowd. Very tired after our full day, standing was not what I was hoping for, but the 20 minute ride was survivable. Then a not-too-long walk to our building and our room at Pop Century. My only regret was not knowing in advance about the new Be Our Guest restaurant in the new Beasts Castle that we could see in the distance. By the time I inquired, reservations were full but I've heard it is a very nice experience. Next time. For this trip I brought along two external USB batteries instead of just one, one small (fits in the pocket with my phone) and one larger that I kept in a pocket in my backpack. When not charging my phone, I would charge the small battery from the large battery. Putting my phone in airplane mode most of the time alleviated most of the need for the large battery, but I'm still glad I had it. Taking videos and photos can be a battery drainer. We thoroughly enjoyed our day at Epcot and Magic Kingdom. The cast members were always (and as always) helpful. Everything (parks and resort) was clean and attractive. Even the weather cooperated beautifully for the time of year…but then, it is Florida. Late September, early October is still my favorite time to come to Disney World, with its stunningly nice weather, still warm enough for night swimming, and enjoying smaller than normal crowds. But now we have discovered that January is also a great time to be here, a massive relief against huge crowds.